We have a special challenge with growing tomatoes in Minnesota. There is often a profusion of green tomatoes left on the vine as the cold weather sets in and a forced harvest is in order. They should not be abandoned because there are dishes you can use them in. Last year, I made this delicious Roasted Green Tomatoes with Sweet Peppers Salsa with green Mortgage Lifter tomatoes that did not have sufficient time to ripen. Having learnt my lesson, I decided to plant fast-growing cherry tomatoes this year but I still ran into the same problem. Towards the end of October when night time temperatures dipped into the 30’s and 40’s, I had to harvest everything except for the carrots from the vegetable garden. I brought in 3¼ pounds of red and green cherry tomatoes. The were more green than red. 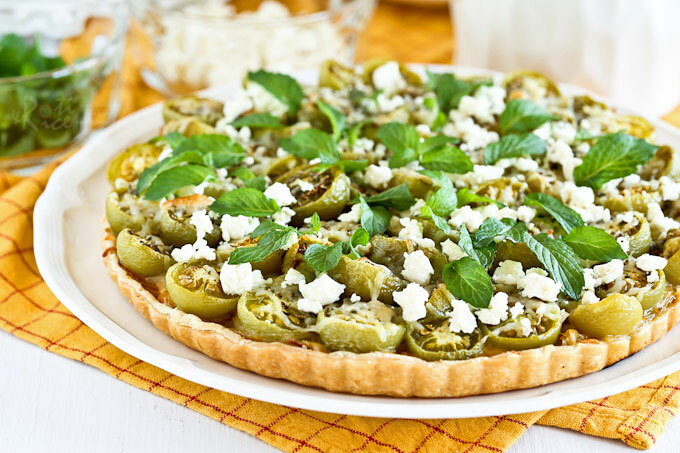 I made a Roasted Cherry Tomatoes salad with the red ones and used some of the greens ones in today’s Green Tomato Tart inspired by this recipe. I used the same crust (minus the hazelnut meal) as the one I made for this Triple Berry Tart. The cheese at the base of the tart helped to insulate the crust from the tomatoes juices, preventing it from getting soggy, which was really nice. The caramelized onions gave the tart great flavor. As a finishing touch, I sprinkled the top with feta and freshly picked mint leaves from the garden. This was of course back in October when my mint was growing abundantly. No chance of that happening right now as the ground is completely covered in snow. Basil may be used as an alternative. Place all-purpose flour, powdered sugar, and cold salted butter in a food processor. Pulse until mixture resembles coarse bread crumbs. Add cold water and pulse again until a sticky dough forms. Remove dough from refrigerator. Unwrap onto a non-stick pastry mat (or a large piece of wax paper). Roll into a 12-inch circle. Invert onto a 9-inch removable bottom tart pan. Press the dough evenly onto the bottom and sides of the tart pan. Trim dough to the edges of the pan, patching where necessary. While crust is in the oven, melt butter in a medium fry pan. Add onions and cook until light golden, about 8 to 10 minutes. 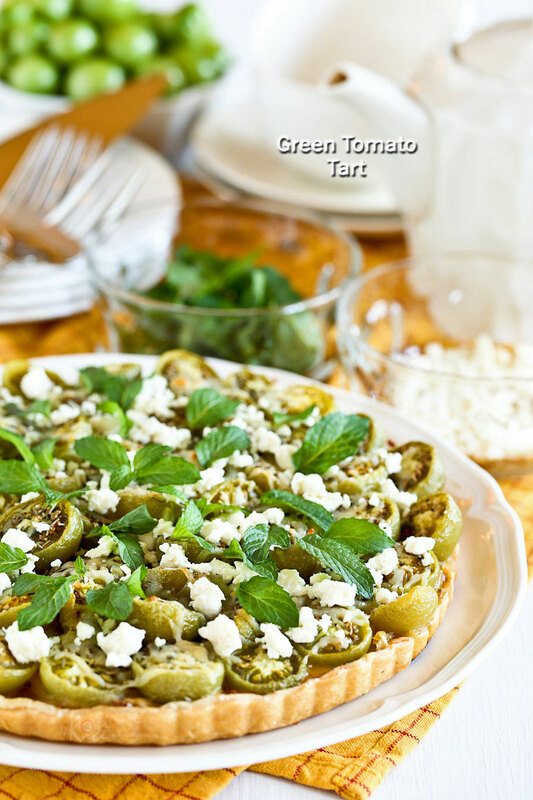 Remove tart crust out of the oven and increase oven temperature to 425°F (220°C). Layer 1 cup (4 oz/113g) shredded cheese evenly over the tart crust followed by the caramelized onions. Then arranged halved green cherry tomatoes on the top. Sprinkle dried thyme, ground pepper, and kosher salt over the tomatoes. Bake for another 30 minutes. Remove tart from the oven and sprinkle remaining ½ cup (56g) shredded cheese over the top. Return the tart to the oven and continue to bake for another 10 minutes. Remove tart from the oven. 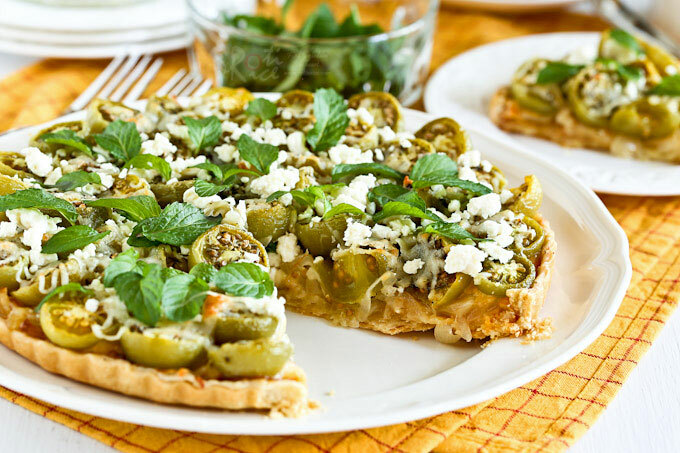 Sprinkle all over with feta and mint (or basil) leaves. You can definitely used red cherry tomatoes from the grocery store as a substitute for green cherry tomatoes. In fact, I think this tart will be the perfect for your holiday table with red, green, and white colors. I hope you’ll give it a try. 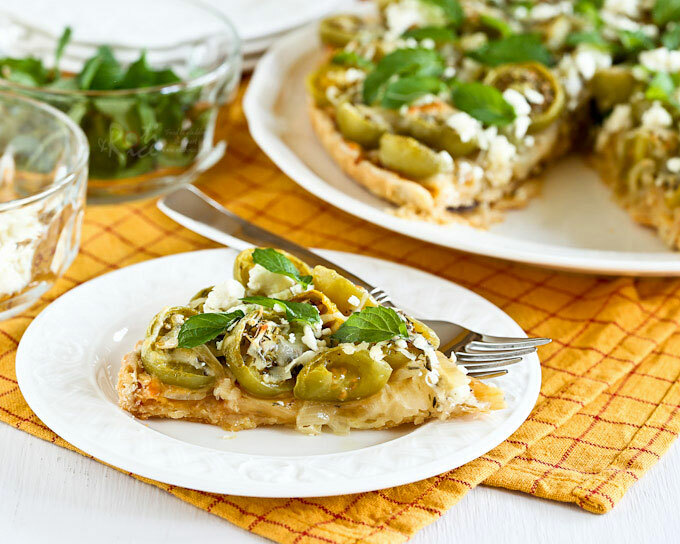 looks so good and great way to use the green tomatoes.